The Mateo Single Lever Pull Down Faucet has a streamlined silhouette that coordinates with any kitchen sink, with a dual-function sprayhead for maximum efficiency. This faucet is made with top-quality components in order to ensure superior performance and durability. A QuickDock mounting assembly eliminates the need to secure the faucet underneath the sink, making top mount installation exceptionally easy. Engineered to be as useful as it is graceful. The Olvera one-handle, pull-down faucet complements kitchens with casual dicor. Features include a swivel spout with pull-down spray, memory position valving that provides water at your preferred temperature and ADA-approved lever handle. Minimalist styling and sleek lines make this Grail kitchen faucet an impressive addition to any space. The lever handle makes it easy to operate, especially with wet or soapy hands, and the pull-down spout swivels 360 degrees. The Glacier Bay Analiese 1-Handle Pull-down Kitchen Faucet in Chrome Finish has a streamlined and timeless transitional style that will complement a wide variety of kitchen decor. Flexible and user-friendly, the 1-Handle lever gives you an extra hand for other kitchen tasks while the high-arc with 360 swivel body provide full sink access. Includes a patented top mount install feature for an easy and simple installation. 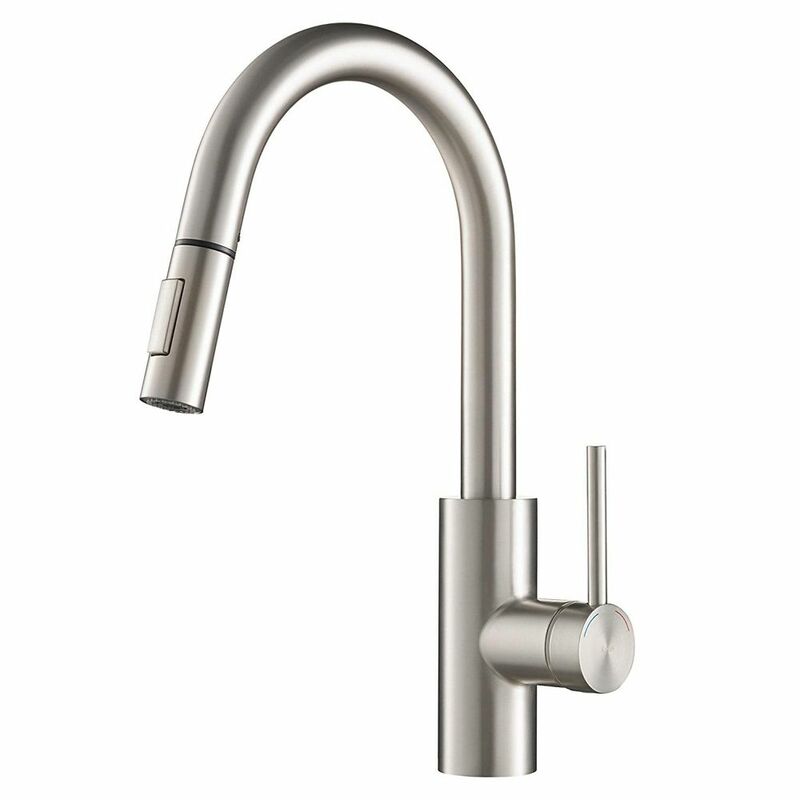 Mateo Single Lever Pull Down Kitchen Faucet in Stainless Steel The Mateo Single Lever Pull Down Faucet has a streamlined silhouette that coordinates with any kitchen sink, with a dual-function sprayhead for maximum efficiency. This faucet is made with top-quality components in order to ensure superior performance and durability. A QuickDock mounting assembly eliminates the need to secure the faucet underneath the sink, making top mount installation exceptionally easy. Mateo Single Lever Pull Down Kitchen Faucet in Stainless Steel is rated 4.5 out of 5 by 135. Rated 5 out of 5 by Mr P from Very high quality and super easy to install I am extremely happy with this faucet. It is well made and the installation process was a breeze! Rated 5 out of 5 by BrokerR2 from Love our Kraus Oletto Faucet It's newly installed, but we are very pleased with the quality of the fixture. Love the swivel and the QuickDock Technology feature. Rated 4 out of 5 by Raj from Kitchen Faucet I am very satisfied with the Kraus Kitchen Faucet. Rated 5 out of 5 by Sandy517 from High quality faucet I am very satisfied with this faucet; so satisfied that this is the second such faucet I have purchased - this for a new place in sunny Florida.